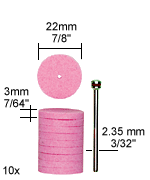 Bits and cutters of industrial and dental quality: Grinding Pins and Discs. Bits and sets of fine, high quality materials of consistent hardness. Various shapes for the widest possible range of applications. For grinding and chiselling hard materials such as cast iron, cast steel, malleable cast iron as well as hard metal alloys and refined steel. 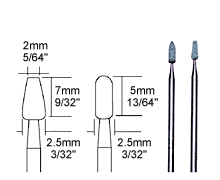 Accurately dimensioned shafts of 2.35 or 3mm (Ø 3/32" or 7/64") ensure maximum concentricity. soft materials = hard grinding bits; hard materials = soft grinding bits! Fine particles of consistent hardness for engraving and frosting of glass, ceramics and stellites. Also for grinding tungsten carbide, chilled cast iron and other hard steel alloys. 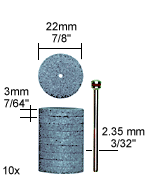 Shafts Ø 2.35mm (3/32").